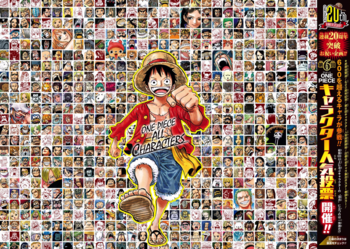 The world of One Piece is large, captivating, and wonderfully diverse and the characters are just as much so. Look no further than here to learn more about them, which are sorted according to their main allegiance within the manga, anime, light novels, video games, and films. Spoilers below. Because consumers of the English versions of One Piece  especially the anime; less so the manga, which is just under a year behind Japan  are at a major disadvantage, it is recommended to spoiler-tag examples after the Marineford arc. Also, some characters' statuses, mostly the Marines and the Warlords, are updated as they are revealed or changed. As a result, they are not spoiler-tagged, leading to potential major spoilers. Also, some characters' very existence are major spoilers in and of themselves, so be extra careful. Please see the Spoilers Policy for further information. Marine Admirals note Former Fleet Admiral Sengoku "The Buddha", Fleet Admiral Sakazuki, Former Admiral Akainu "The Red Dog", Admiral Kizaru "The Yellow Monkey", Admiral Fujitora "The Wisteria Tiger", Admiral Ryokugyu "The Green Bull", Former Admiral Aokiji "The Blue Pheasant"
Charlotte Linlin  "Big Mom"